In this episodic novel of World War II, a young American soldier stationed in Italy fights in the Battle of Anzio and observes a host of quiet horrors along the way. This first novel, inspired by the experiences of Kippert’s late father, follows a soldier named Bob Kafak through his experiences in Italy at the tail end of the war. It intersperses tense scenes of combat with lighter scenes of Kafak and his peers and occasionally moves away from the front lines entirely. The novel is neatly structured, which is of a piece with Kafak’s experiences: “Because each time you went under fire was a new time. Each time was the first time, sort of. 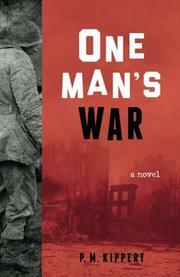 All over again.” This isn’t a novel with scenes of individual heroism; instead, Kippert focuses on the messiness of battle. At one point, Kafak shoots at a group of German soldiers, who all fall—but he’s far from the only one who was firing in their direction. Much of the time the action is intentionally chaotic: one description of combat zeroes in on Kafak’s specific actions—firing his gun, throwing a grenade—while withholding the larger picture until after the battle has ended, to nerve-wracking effect. That focus is intentional: in the novel’s preface, Kippert briefly explains his decision to stay with Kafak’s perspective and not reveal the bigger moments in broad strokes. (An Author’s Note at the end of the book provides a larger historical context.) Thanks to Kippert’s matter-of-fact storytelling, the bleakness accumulates without ever overwhelming the tale. In the novel’s first quarter, one of Kafak’s fellow soldiers abruptly shoots himself, while another loses a foot to gangrene; there’s also a memorably scatological use for uniform helmets. Throughout, a balance is achieved between the absurd and the harrowing. Through its attention to detail and its deliberate perspective, Kippert’s first novel delivers a precise, tense, and moving story.